Every time you think you have a fix on Montana’s special U.S. House election tomorrow (held to fill the House seat of new Interior Secretary Ryan Zinke), something changes. The early feeling was that this at-large contest was, like an earlier special election in Kansas, in territory just too Republican for any Democrat to win. But then Republicans started looking and acting notably jittery about it. Montanans patiently explained to outsiders that local factors, not national issues or partisanship, would matter most. 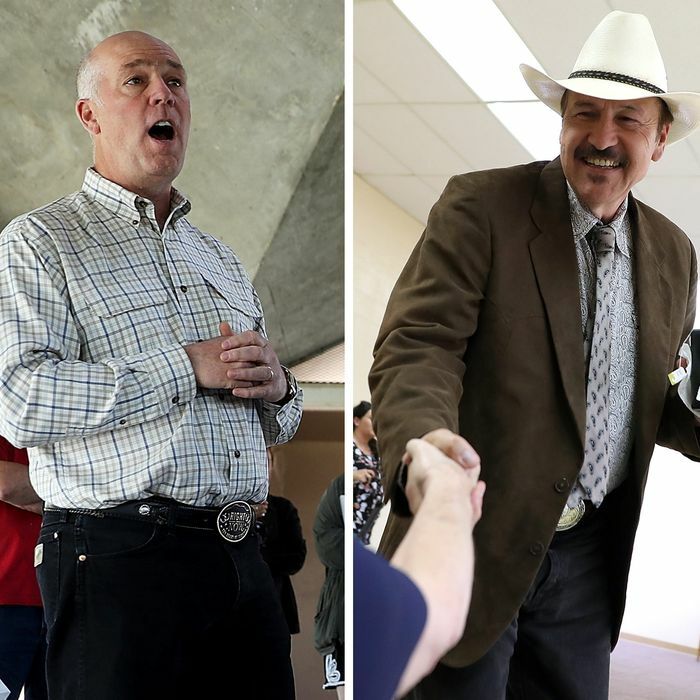 And for a while the battle between Republican business owner Greg Gianforte and Democratic bluegrass singer Rob Quist revolved around attacks on each other’s personality and foibles (Gianforte’s carpetbagger status and wealth, Quist’s personal finances), and not on any big national themes. As election day approached, however, Quist brought in Bernie Sanders and pounded his opponent for supporting Trumpcare, while Gianforte brought in Donald Trump Jr. and Mike Pence, and practically made MAGA his slogan. National money has eaten up the state’s cheap television markets. And in perhaps the ultimate sign of a nationalized contest, Team Quist appears to be hoping their candidate gets a last-minute boost from a nasty-sounding Congressional Budget Office “score” of the American Health Care Act. Most of all, not that long ago it looked like we had a bead on the trajectory of the race: The very few public polls, and buzz in both Montana and in D.C., suggested a steadily tightening contest, with the Republican’s comfortable early lead dwindling into the single digits. But a final poll from Gravis Marketing — a firm that showed Quist within 8 points of Gianforte on May 4 — had Gianforte blowing back out to a 14-point lead. The reality is that no one knows quite how to predict turnout patterns for a Thursday special election before a long holiday weekend, in Montana or anywhere else (many polling places had to be reassigned because of conflicts with other events), or the partisan impact of varying levels of votes by mail (that final Gravis poll showed 36 percent of respondents having already voted) and in person. And there is no question both national parties could be playing the expectations game. Republicans would like to treat any win, however narrow, as the biggest upset since, well, the presidential election last year. And Democrats, after being criticized for not doing enough to help Kansas-04 candidate James Thompson in April, and counting on donor and voter enthusiasm, have perhaps oversold the odds of a win for Quist. So the spin emanating from the elephant and donkey camps late tomorrow will be almost as interesting as the outcome.